Speaker Simulation for electric guitar. Home / Speaker Simulation for electric guitar. Cab Rock & Load Rock Speaker Simulation for Electric Guitar ! Cab Rock& Load Rock Speaker Simulation for Electric Guitar ! 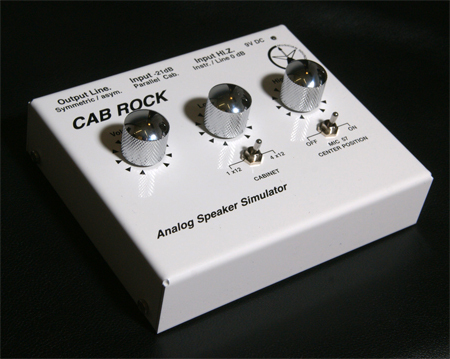 Our Cab Rock Speaker Simulation was developed, aided by State of the art FFT Signal Analysis. 3. a balanced and an unbalanced output. Besides the running of line signals the Hi Z input offers the possibility to directly connect effect such as distortion and chorus etc. This means , one can connect directly to a mixing desk or audio interface. But; never use this input without load! The pad is set , so that output signals up to 100W can be tapped in parallel with the speaker cab. Via dip switches, two different cab simulations are available; 1×12 and 4×12 as well as the typical mic in front of the cab sound when used with a 4×12 speaker, selected via the Mic 57 Center Position switch. Two tone control pots( Low and High) allow various on Axis( more high frequencies) and off Axis( less top end) sounds to be dialled in. Another application is the combination with our Power Break Load Rock, for in ear stage monitoring. Input 2: -21dB only in Parallel Cab Mode. Output: Balanced and unbalanced, via 1/4 ” socket. Load Rock for Tube Amplifiers is a device, providing dynamic, frequency-dependent Load that does not require external power supply. It can be connected to an 8 or 16 Ohm load from the amplifier. The transformer-balanced out signal provides a +6dbV line signal at 100W RMS max. 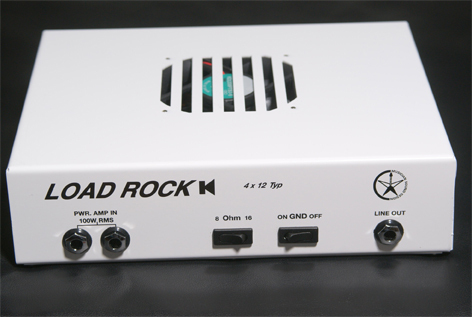 With this, our Speaker simulation Cab Rock, or a recording interface can be driven directly. 1) Load Mode; for in ear monitoring and playing without a speaker cabinet. This way, output can be reduced by 50% and a line signal sent out , simultaneously. Copyright © 2016 Musician Sound Design. All rights reserved.